It was while in college at Washington University, St. Louis ,aged 19,that Ike first met Frank Zappa. Ike was studying political science. He volunteered to help with the concert committee just so he could get a “Back Stage Pass” to meet Frank Zappa. The rest as they say, is history. As the one of longest playing members of Frank Zappa’s bands, (1978-1988) Ike is still upholding his promise to Frank. That promise is to continue on, playing the music of which Zappa had taught Ike oh so well. To this day Ike fulfils Frank’s wish. 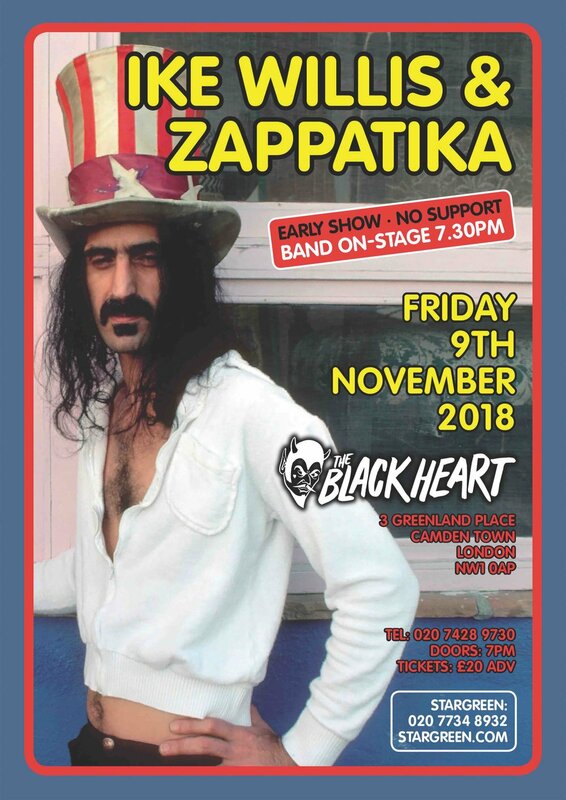 ZAPPATiKA, leading interpreters of Frank Zappa's music, join forces once again with legendary Zappa frontman Ike Willis, hero of Joe’s Garage and Thing-Fish ! Ike sang lead vocals and played guitar on many classic albums and toured extensively with Frank. Hear Ike's unmistakable voice on Joe’s Garage, You are what you is, Tinseltown Rebellion, Ship Arriving, Man from Utopia, Thing-Fish and more. Expect a punishing two and a half hour set of 100 percent Zappa! Amsterdam based international ensemble ZAPPATiKA are known for their diverse and dynamic live shows which really capture the atmosphere, rich diversity and humour of Zappa's own shows in the past. The band has English, Italian, American and Dutch members. They first played with Ike Willis in 2010 and have subsequently toured many times with him throughout the UK and Europe.